Oileán Thoraí (or Tory Island) lies 14.5 km off the northwest coast of Donegal. It is a special island, with unique character and heritage. About 170 people live on the island, and Irish is the native tongue. In recent years the island has become home to a flourishing artistic community. Tory is unique in Ireland as it still has its own king, Patsai Dan Mac Ruaidhrí, who will be on hand to welcome visitors to this beautiful island. 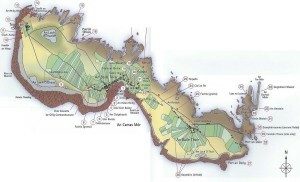 The island is just 4.5 km long and, at its broadest, less than 1.5 km wide. The main axis of the island is oriented north-west to south-east, with the land tilted to the north, where the cliffs rise to 85m. The southern shore is low-lying rocky shore and boulder beach. Shingle runs along the south-west shoreline and forms a barrier to impound a small lagoon, Lough Ayes. Heath and cutaway bog occupies much of the interior and northern part back from the cliffs, while much of the remainder of the island comprises wet or dry grassland, some of which is improved. There are two lochs in the western end of the island, Loch ó Dheas (Loch Ayes) and Loch ó Thuaidh and a small area of marsh vegetation in the East, a favourite spot for birdwatchers. The land is grazed extensively by sheep with some small areas of arable land. The island supports really special wildlife. It is the headquarters of Ireland’s threatened corncrake population, supporting about one sixth of the total Irish breeding population. It also boasts a diverse breeding seabird and wader population, making Tory a really special place. Already there are 136 species recorded from Tory Island on the national biodiversity database, but there is much more that remains to be discovered. Download a list of the species here: Tory Island species list.